No Soil Better is an exhibition of new artworks by a diverse group of emerging and established artists including Yvonne Buchanan, Caitlin Cass, Shawn Dunwoody, Annette Daniels Taylor, Olivia Kim, Luvon Sheppard, Thievin’ Stephen, Meleko Mokgosi, Rodney Taylor, and the Rochester Public Library. The featured projects reflect on how Douglass has been memorialized and the importance of his legacy today. 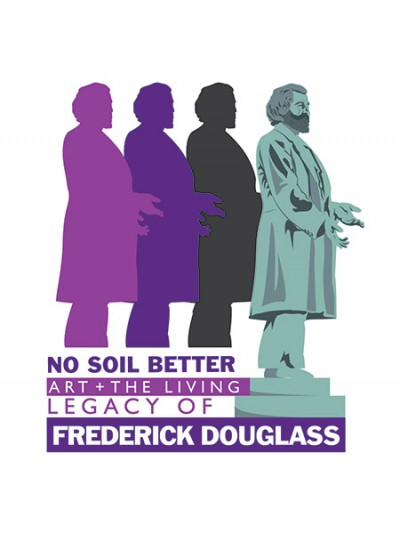 This exhibition is presented as part of the Frederick Douglass Bicentennial Commemoration Committee organized by Rochester Community Media Center (RCTV) and RoCo. Shine A Light on Douglass is presented in conjunction with the exhibition and organized by RIT’s Big Shot team. Join us on February 14, in Highland Park to help Rochester celebrate Frederick Douglass’ birth and create an important archival photo of the Douglass Monument (1899) by Sidney W. Edwards.